There is a great muralist movement in Puerto Rico. Artists like Alexis Díaz, Bik Ismo, The Stencil Network, Aslan Uno, Vero Rivera, among others have decorated our streets for the enjoyment of residents, tourists and everyone that appreciates good art. We at Infopaginas, inspired by local artists, decided to show that talent to the general public. That's the reason that for our new edition of local directories, we contacted a few artists from the island so they can create unique 5 unique pieces of art for our covers. In these, we combine an artistic generation with a digital tendency that we're moving towards, especially in the fields of communication and business. Analog to Digital, is a series of murals that will decorate our covers, and will live on their walls in the 5 different regions (Metro, North, Central-East, West, South). 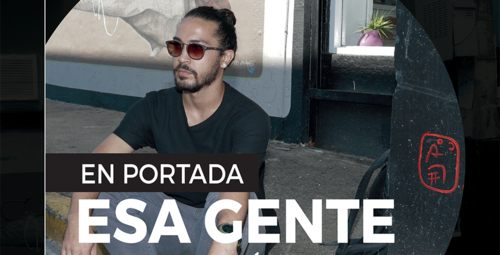 For our first edition, we present the artist Esa Gente, which presents us a romantic gesture of a bouquet of roses used as bait on a Whatsapp message. This image shows us a clash between to eras divided by the technological boom and presents a change in the matters of a love conquest.